Providing 15 euros you will be flattered with a collaboration diploma giving you thanks by the research team. Shipping included to the Peninsula. Providing 20 euros it will be sent a special invitation to participate in a customized Open day explaining the details of the Pediatric Emergency Research at Cruces University Hospital (Bilbao). On that day will be present the researchers of the projects, along with a series of presentations, so you can discuss with them the reality of pediatric medical research. Thanks in Pediatric Emergency Web of Cruces University Hospital. Providing 20 euros, you will be flattered with a printed basic guideline to recognize and act on pediatric poisoning in the outpatient setting. Shipping included to the Peninsula. Thanks in Pediatric Emergency Web of Cruces University Hospital. Providing 30 euros will be flattered with a collaboration diploma giving you thanks by the research team and it will be sent a special invitation to participate in a customized Open day explaining the details of the Pediatric Emergency Research at Cruces University Hospital (Bilbao). On that day will be present the researchers of the projects, along with a series of presentations, so you can discuss with them the reality of pediatric medical research. Thanks in Pediatric Emergency Web of Cruces University Hospital. Providing 35 euros you will be flattered with a printed basic guideline to recognize and act on pediatric poisoning in the outpatient setting and a collaboration diploma giving you thanks by the research team. Shipping included to the Peninsula. Thanks in Pediatric Emergency Web of Cruces University Hospital. 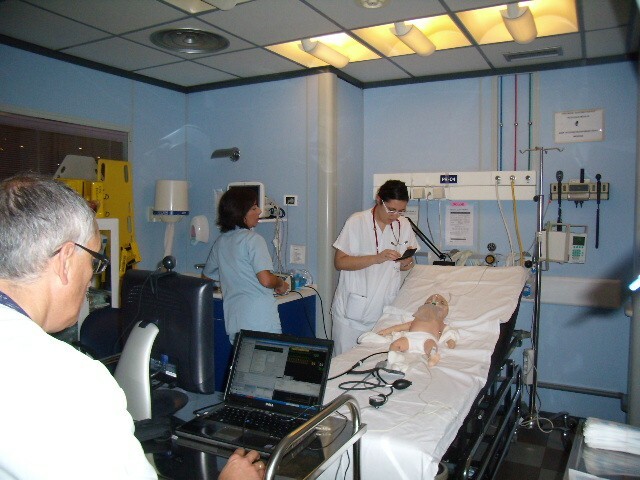 Providing 40 euros, you will receive a special invitation to participate in a customized Open day explaining the details of the Pediatric Emergency Research at Cruces University Hospital (Bilbao). On that day will be present the researchers of the projects, along with a series of presentations, so you can discuss with them the reality of pediatric medical research and a printed basic guideline to recognize and act on pediatric poisoning in the outpatient setting. Shipping included to the Peninsula. Thanks in Pediatric Emergency Web of Cruces University Hospital. Providing 50 euros, you will receive the premium to be an expert in childhood poisonings. Includes: (1) a collaboration diploma giving you thanks by the research team; (2) a special invitation to participate in a customized Open day explaining the details of the Pediatric Emergency Research at Cruces University Hospital (Bilbao). On that day will be present the researchers of the projects, along with a series of presentations, so you can discuss with them the reality of pediatric medical research; (3) a printed basic guideline to recognize and act on pediatric poisoning in the outpatient setting. Shipping included to the Peninsula. Thanks in Pediatric Emergency Web of Cruces University Hospital. 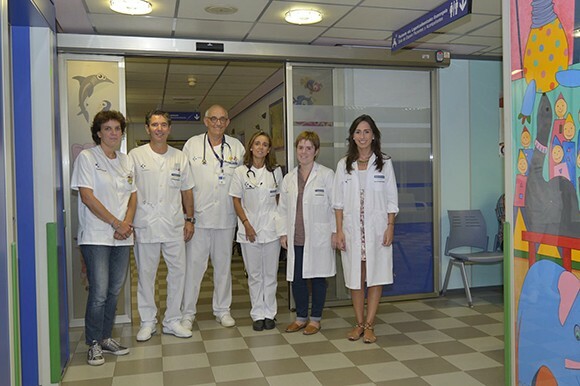 The Pediatric Emergency equipment at Cruces University Hospital, offers to give informative talks in schools in Bizkaia, aimed at parents and students, on guidelines for action in poisoning. For centers in other geographical areas, will be held via Skype. Thanks in Pediatric Emergency Web of Cruces University Hospital. More than 20 countries involved. Over 1,000 poisoning episodes. A way to understand and prevent poisoning in the pediatric population through an international register. Assistance to the American Pediatic Networks Meeting. It is the largest meeting and most prestigious dedicated to pediatric research and education in the world, bringing together about 7,000 physicians experienced in all areas of pediatrics. We seek to present the results. Help accommodation, travel and registration. Expenses arising from 8% commission drip and a 2% bank fees and Paypal. Help accommodation, travel and registration. In this meeting annually gather the main groups of European Emergency pediatricians. It is the ideal forum to present the results in Europe. We seek to present the results. We need to cover the cost of printing and publishing a guide of recommendations aimed at families, according to the results obtained in the study. Expenses incurred in the performance of individual rewards as well as shipping costs. The dramatic economic situation we live in today, the low or even non existing public budget for medical research and the refusal of some private companies to subsidize non for profit projects, are some of the reasons that have pushed us to initiate this crowdfunding campaign. To date, never so many different nations’ hospitals had agreed to develop a record of pediatric poisonings surveillance system. Pediatric acute poisoning is a major health problem. In most cases does not usually cause a major damage, but it doesn’t mean no risk, and in some cases, it may even result in death. It is true that we have spent several years working on the issue, but we have yet much to learn. No prior medical community has had access to such a numerous register, in which more than 1000 episodes have been recorded to date. The analysis of the data will help us managing better our children and youth, and the differences found will design agreed treatments and more effective preventive strategies. However, as it has always happened, information is power once it is known, otherwise our work is in vain. We need funds to report the results of the register in different international meetings and to enrich the scientific community while contributing to the resolution of this social problem. For several years the medical staff of the Emergency Pediatric Department (EPD) at Cruces University Hospital has been involved in the issue of intoxication. Initially we used the data of patients who came to our hospital, but we saw that the number of patients was insufficient to draw conclusions that could be extrapolated to the rest of the pediatric population. 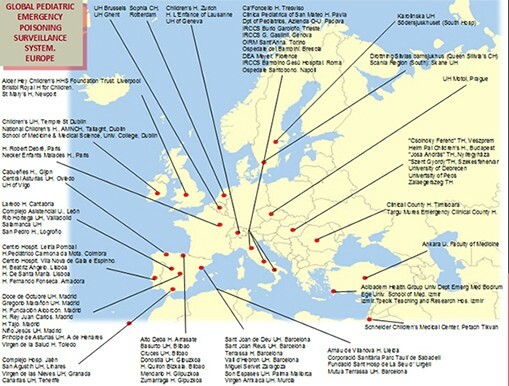 Therefore, and with great effort, in 2008 we created at the SEUP (Spanish Society of Pediatric Emergencies ) a toxicological Observatory, which today has included 44 hospitals along the Spanish geography. The main goal of this partnership was to have access to a greater number of poisoning episodes, so recording more data we could make a bigger analysis and have more reliable results. 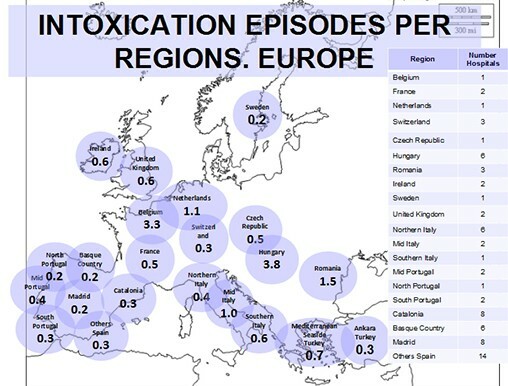 Today is still ongoing, in five years of work, we have collected more than 500 episodes of intoxication. Taking into account that the track and results of the national registry were extraordinary, we wanted to go further and thought about the possibility of having access to pediatric poisonings all around the world. Thanks to the friendship we had in different medical meetings, and the extraordinary work of our team, we reached and involved other pediatric hospitals, and gradually, as more centers were added into the project, others were encouraged to join. In approximately 6 months, and after endless crazy emails, we put together more than 130 pediatric emergency departments willing to participate. 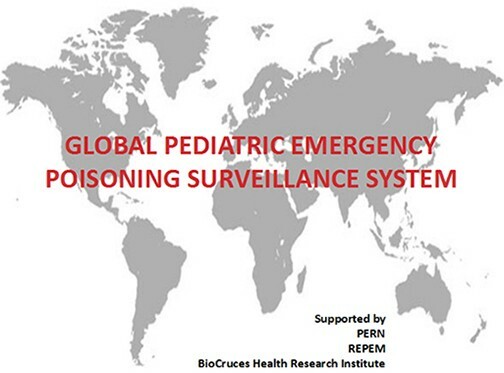 After making the necessary arrangements with hospital ethics committees and getting the support of the largest worldwide pediatric emergency research networks, we started in January 2013 the GLOBAL SURVEILLANCE SYSTEM POISON IN PEDIATRIC EMERGENCY (http://urgenciaspediatria.hospitalcruces.com). Subsequent to 9 months of hard work, we have recorded over 1,000 episodes and published the first data analysis, which is the greatest reward for those who work in it. 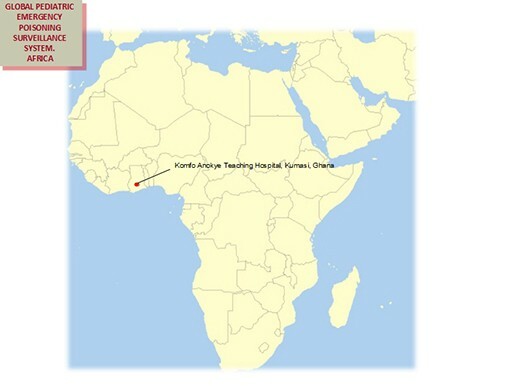 This is a scientific study involving pediatric emergency services in different regions, countries and continents. Design: Prospective study based on an international multicenter registry. EPD will be included to provide patients cared for acute intoxication on the 4th, 14th and 24th of each month. These services must provide, also, the total number of episodes recorded in the EPD that day. Inclusion of patients: All patients seen for an alleged intoxication on the 4th, 14th and 24th of each month should have a specific electronic questionnaire filled by the patient 's attending physician. The electronic questionnaire data automatically sent via Internet to the principal investigator, who takes responsibility for the integrity of the data and the accuracy of their analysis. • fate and patient outcome. Data relating to the circumstances of the poisoning are obtained by the physician treating the patient interviewing the patient and his/her family and / companions in their own EPD. 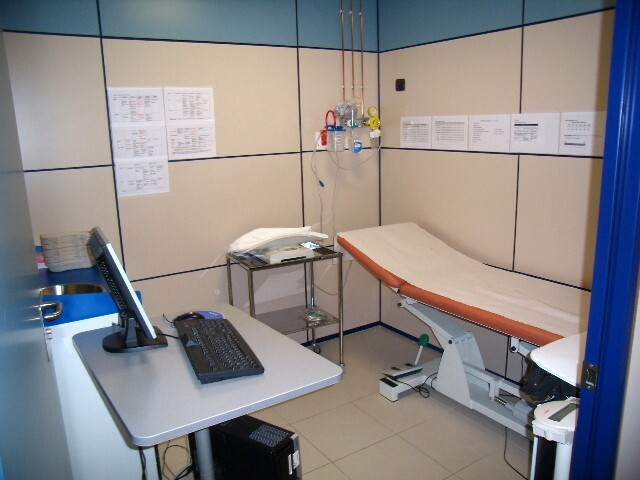 • All patients visiting the EPDs included in the Observatory with a possible poisoning according to the anamnesis, clinical and clinical or laboratory findings . • Organizational differences of the different health systems of different countries or regions may warrant a different upper age limit for inclusion in the registry. • Patient has been informed and their parents have been given sufficient time and opportunity to consider their participation and have given consent. • The subject is willing and able to meet all the requirements of the study. • Cases of adverse reactions and side effects to drugs . • Intakes of foreign bodies. • Patients and / or guardians / parents who do not sign the informed consent. Informed consent must be obtained prior to the start of data collection. 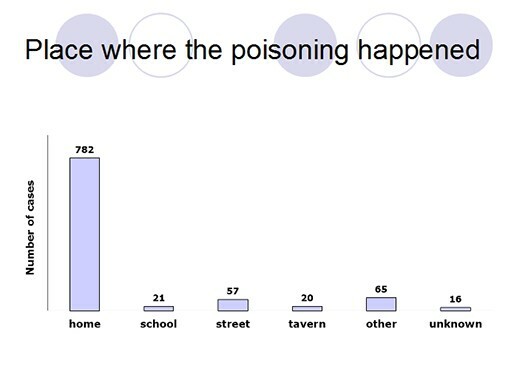 Acute poisoning by drugs account for about 55 % of acute poisoning collected in the EPDs Poison Observatory. • Consider the rate in the different countries in industrialized countries varies between 45 and 60 %, to find differences of 10% between countries need about 90 episodes / country or health region (80 % power, alpha = 0.05 ). 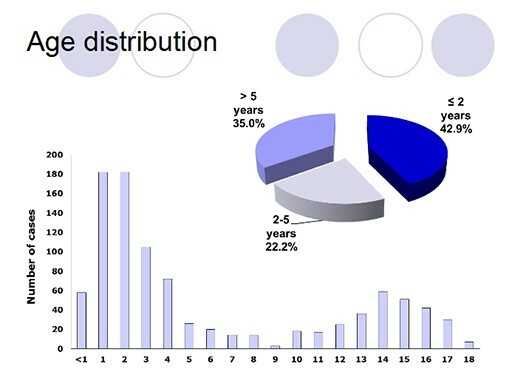 These figures would apply to the pilot phase of the study. • Consider the rate in different countries around the globe between 30 and 60 %, to find differences of 10% between countries need about 25 episodes / country or health region (80 % power, alpha = 0.05). • Consider the rate in the different countries in non-industrialized countries is between 30 and 40 %, to find differences of 10% between countries need about 350 episodes / country or health region (80 % power, alpha = 0.05). 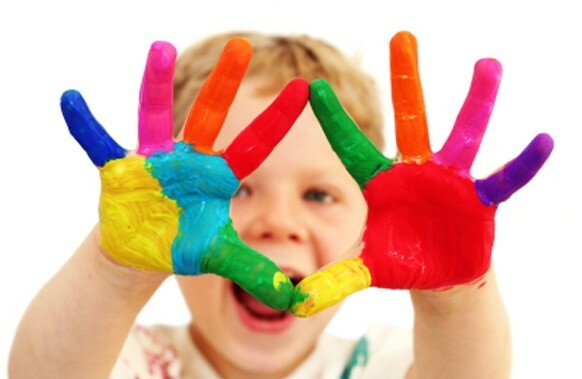 This project is addressed to children and their families in the regions and countries included. The dramatic economic situation we live in today, the low or even non existing public budget for medical research and the refusal of some private companies to subsidize non-for-profit projects, are some of the reasons that have pushed us to this crowdfunding campaign. Furthermore, this funding method is a major innovation in the field of health, and perhaps serves as a guide for funding projects in which there is no direct economic goal behind but a social one as it is the case of decreasing recreational poisoning in our youth. 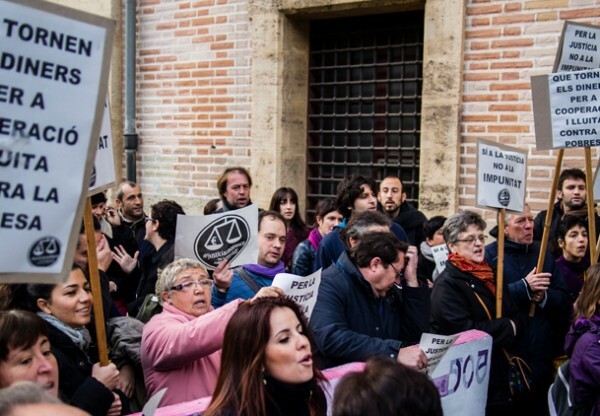 We believe it is essential to involve society, as all together (parents, teachers, doctors ...) can exert a greater pressure to the authorities, which play an important role in reducing these events, for example by the creation of new laws. A clear example, we could mention the bleach (today in household the maximum concentration can not exceed 5% in total), this concentration is not toxic, and has thus avoided numerous consultations. Back to the beginning, we need to mention that, if the target population is families, we should first reach the medical scientific community and health authorities that the results reported are reliable and then support measures directed to the population. Doctors, especially pediatricians who may attend meetings in which registration fee is requested, are the first population "target". We have listed more than 130 hospitals, and thus, a preliminary step of diffusion is guaranteed. 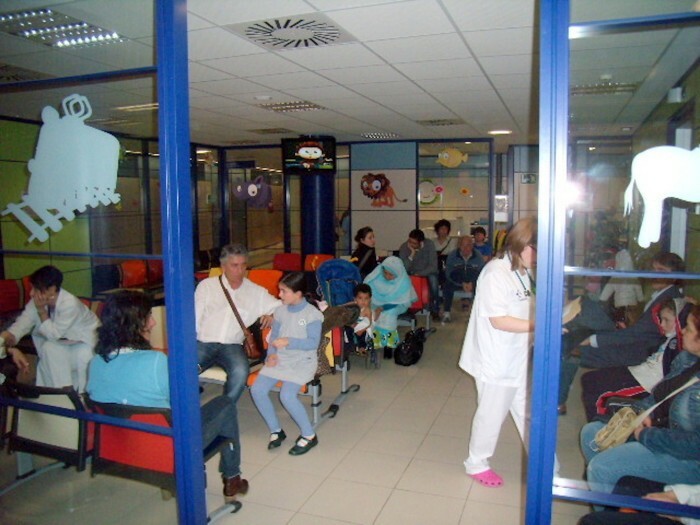 To date, besides seven Basque hospitals, hospitals from 27 countries on five continents are also included, predominantly from Europe and America, both South and North. • Creating a directory of recommendations from the results obtained in the study to improve pediatric poisoning management. • Creating an online platform for the public display of the results. This can be useful for medical research being closer to society, and specifically to the Basque society. • Covering the costs of production management and collective returns and individual rewards Drip Campaign. In the dissemination of the results, it is essential that the work has an impact on society. Some of us are exclusively dedicated to pediatric emergency department, other pediatricians are in training (internal resident) and, finally , staff from the Research Unit of Cruces University Hospital. 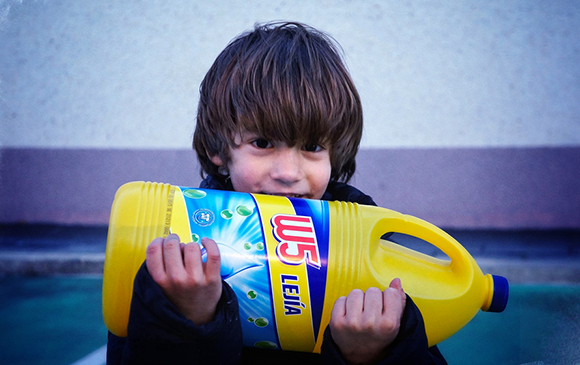 In August 2008 , the Poisoning Working Group of the Spanish Society of Emergency Pediatrics (SEUP) established an electronic surveillance system in different toxicological emergency pediatric departments, named the Toxicology of SEUP. 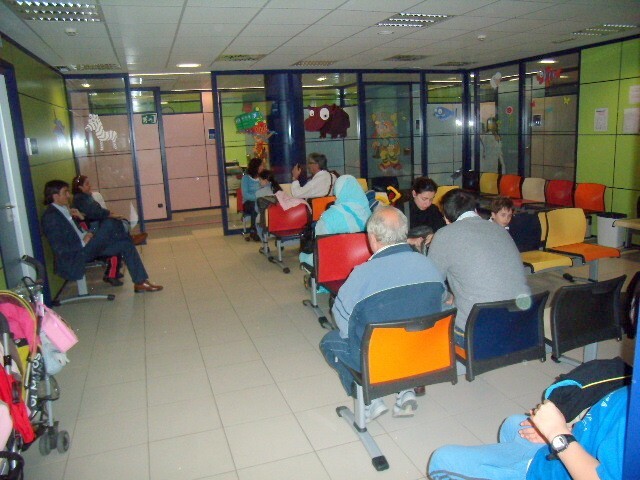 The Observatory has facilitated the analysis of the epidemiological changes in acute poisonings treated in Spanish EPDs and quality of health care provided to these patients, identifying important needs for change in our environment (increased ethanol poisoning in the last decade in Spain, improved quality of care provided to children and adolescents who are with acute poisoning at emergency ward). The International Observatory was proposed once the experience of SEUP was analyzed, and after being noticed that there are cultural differences and important habits among populations around the world, probably defining the circumstances that concur in pediatric acute poisoning. The identification of the different expected risk situations existing in different regions could guide policy makers and health authorities to make more effective preventive measures, considering the legal, social, cultural and organizational differences of the different areas and countries. 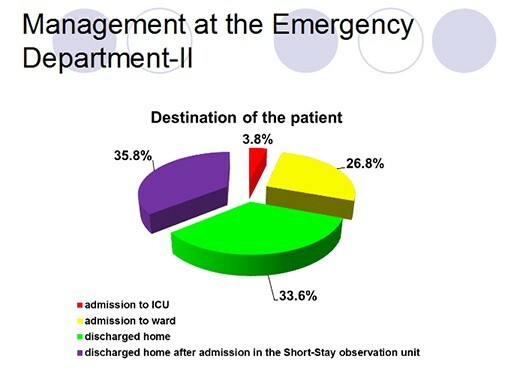 Preliminary results of the first months of the International Observatory were presented at the VII Mediterranean Emergency Medicine Congress (MEMC VII) held in Marseille in September 2013. In this presentation, which included nearly 400 episodes, substantial epidemiological differences were detected between the different health regions included. 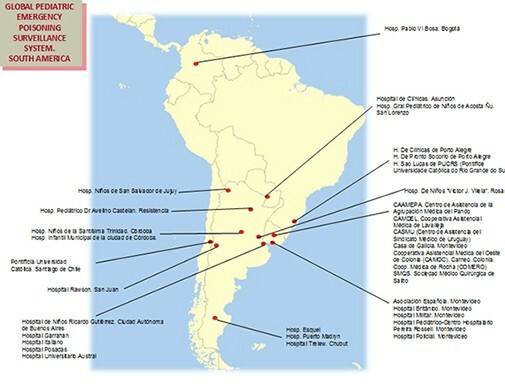 In the research they collaborate Río-SEUP-SPERG, AEPED and PEM-database. Ri-SEUP-SPERG: Research Network of the Spanish Society of Emergency Pediatrics (RISEUP) - Spanish Pediatric Emergency Research Group (SPERG). It aims is to promote the development of quality research, multi-institutional, for the prevention and care of acute illnesses and injuries in children and youth of all ages. AEPED: Web of the Spanish Association of Pediatrics, where also they can see different studies and initiatives in pediatric emergency and which support the current project. PEM-database: The Pediatric Emergency Medicine Database. Website which publishes major studies worldwide on Pediatric Emergency. Our broad experience can be supported in our scientific publications. 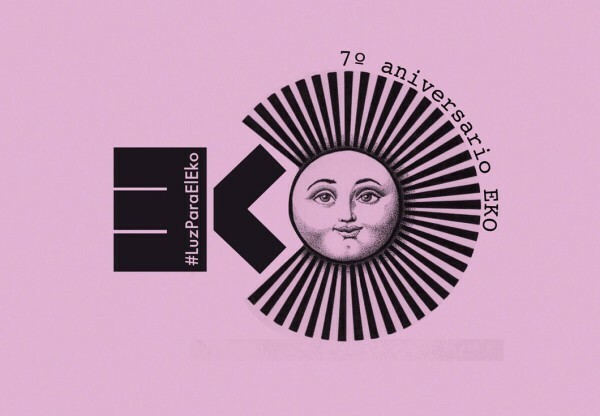 • Mintegi S, Fernández A, Alustiza J, Canduela V, et al. Emergency visits for childhood poisoning: a 2-year prospective multicenter survey in Spain. Pediatr Emerg Care. 2006; 22(5): 334-8. • Azkunaga B, Mintegi S, Salmón N, Acedo Y, Del Arco L; Grupo de Trabajo de Intoxicaciones de la Sociedad Española de Urgencias de Pediatría. 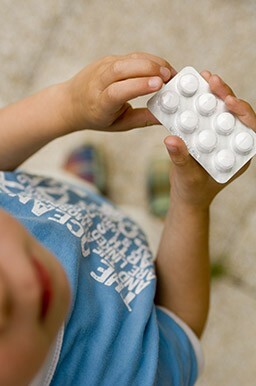 Poisoning in children under age 7 in Spain. Areas of improvement in the prevention and treatment. An Pediatr (Barc). 2012 Nov 5. doi:pii: S1695-4033(12)00431-6. 10.1016/j.anpedi.2012.09.016. [Epub ahead of print]. The ultimate goal of the study is to increase awareness about pediatric poisoning, so that we are able to manage it better and above all, to avoid them. Disclosure day in the Emergency Pediatric Research. It will be offered to all people that participate to an open day to explain the details of the Pediatric Emergency Research. On that day they will present the project's researchers and, in addition to a series of presentations, you can discuss with them the reality of pediatric medical research. Development of an online guide providing information on the most common mechanisms of toxicity in children and adolescents in different regions, as well as more effective preventive measures Likewise we will informa about what can do the father, mother or other caregiver when a child or adolescent ingests a toxic substance, before going to hospital. Online publication of the evolution of the study. Online publication of the evolution of the study (hospitals participating, number of cases reported, ...) and also the results presented in international meetings attended. In the following montsh the holding of scientific meetings would be exposed to the public free access to the results presented and the discussions generated. Ask help to some printing for printing the guides for families. We ask for the help of different websites and blogs dedicated to parents for spreading Drip campaign for 4 weeks.